Come June 6, and 10 pieces of jewellery by the countrya��s leading jewellers will go on auction at Christiea��s, Mumbai. Proceeds from this auction will go towards the education of underprivileged girls. An initiative by UK-based Gemfields, a leading supplier of responsibly sourced coloured gemstones, this project is in aid of Project Nanhi Kali, established in 1996 to provide quality education to underprivileged girls in India. a�?We hope to educate about 2,000 girls and expect to raise at least `50 lakh from the auction. The jewellers will be getting the manufacturing cost of the pieces and the profits will go towards the cause,a�? says Rupak Sen, the regional marketing director, Asia, for Gemfields. These creations were exhibited at Amethyst yesterday, and here are a few of them in case you missed the unveiling. 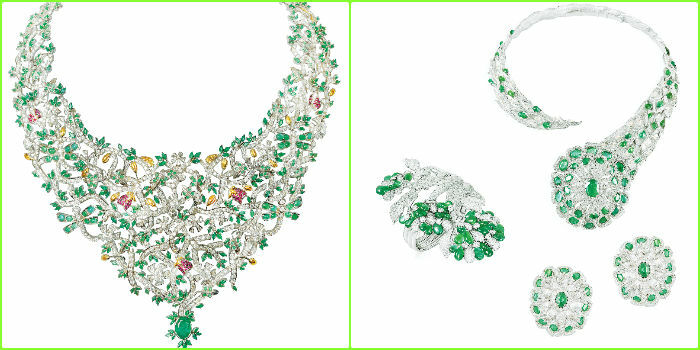 This necklace by the Bangalore-based brand is crafted with diamondsa��Zambian emeralds and Mozambican rubiesa��and set in 18-karat white gold Estimated between Rs. 39,00,000 andA� Rs. 47,00,000. New Delhi-based Hazoorilal has created a brooch that symbolises the girl child in bloom. 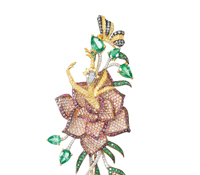 It has yellow diamonds emerging from a flower of rubies and white diamondsa��surrounded by emerald and diamond leaves. Estimated between Rs. 21,00,000 and Rs. 25,00,000. Set in 18-karat white gold, this cuff has flowers made of emerald briolette and diamonds that can be opened. By Baroda-based Narayan Jewellers, it is estimated between Rs. 35,50,000 and Rs. 43,00,000.